The election result in Greece has pushed the euro to an 11yr low, falling below €1.11 to the dollar for the first time since 2003. Investors soured as anti-austerity party Syriza won a majority promising to renegotiate Greek debt and end austerity. Shared by Greece and 18 other eurozone members, the euro fell 8.94 percent to €1.1105 per 1 USD on the opening of trading Monday as investors and creditors are worried the new government will fail to pay off the country’s €317 billion debt. The euro has lost 7.7 percent against the dollar this year, making it the worst performer of all the hard currencies. After the immediate aftershock, it strengthened to €1.12 to the dollar. “Syriza's victory is a European victory against austerity,” the leftist party’s leader, Alexis Tsipras, said after clinching victory Sunday. The party, the first to win a national election on an anti-austerity platform since 2008, has campaigned on the promise to end austerity and renegotiate the terms of its bailout package with its Troika of lenders- the European Central Bank, the International Monetary Fund, and the European Commission. On Sunday, Syriza gained 36.5 percent of the popular vote in the parliamentary election, but is 2 seats short of winning an absolute majority, meaning it cannot act alone, and needs to seek support from other political parties. So far, Greece has received €240 billion ($269 billion) in bailout funds, with the first big tranche paid out in 2010, and the second in 2014. Greece was the first EU country to seek financial assistance from European lenders to help the government pay its creditors, after the 2008 crisis exposed the country’s massive overspending and budget deficit. The economic ‘haircut’ has meant major budget cuts and tax increases, which after six years of deep economic recession, have only just started to boost economic growth. “The EU was destroying its people of one its member states with the idea of trying to save it. Nothing worked, the country is in a catastrophe,” Leonidas Chrysanthopoulos, a former Greek diplomat, told RT. Syriza has promised to change all of that, pledging immediate relief to the poor, rolling back unpopular taxes and negotiating a debt write-down with the country’s creditors to free up spending on social programs. Proposed reforms include cutting taxes for the middle class and crack down on the rich, as well as raising the minimum monthly wage by 29 percent. Tsipras also guaranteed to provide free electricity and food subsidies for poor families, as well as free healthcare for the uninsured and unemployed. “Debt is not just a Greek problem. It is not even just a problem of the south, the countries of the EU periphery. It is a European problem,” Syriza MEP Professor George Katrougalos, told RT. Katrougalos thinks Greece deserves the same help that ‘southern’ countries like Greece and Spain gave Germany over sixty years ago. In 1953, half of German war debts (16 billion marks) were annulled to help its economy recover. “If we have an EU divided and countries that cannot pay their debt, and countries like Germany are gaining from that, we have a union that can no longer keep its cohesion,” Katrougalos said. Eurozone finance ministers will hold a scheduled meeting in Brussels Monday, with Greece expected to top the agenda. 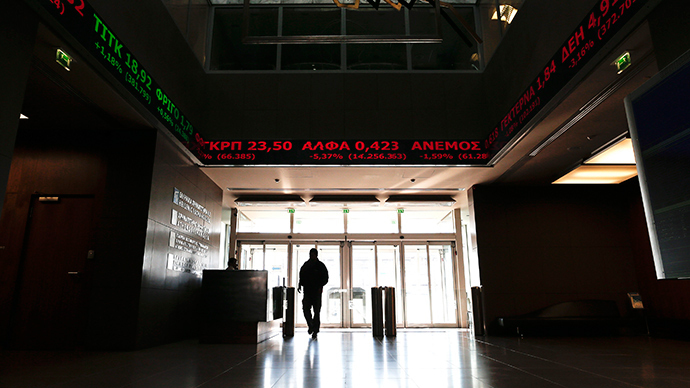 The EU has signaled it will be able to handle a Greece exit from the single currency union. Last Thursday, European Central Bank President Mario Draghi announced that Europe would embark on a US-style stimulus program, injecting a total of €1.14 trillion into the economy over the next two years. However, the bank said it will not buy any Greek government bonds (debt) as a part of this program until at least July, when Greece is due to repay some of its debt to the ECB.